In this tutorial we'll show how to get your very first listening adventure underway - listening to FM radio and decoding the RDS/RBDS data signal that is sent along with many FM radio stations as well. Next, we'll set up the software -- if you're using windows, head to the next page -- SDR-Sharp for Windows. On mac os, jump to the page CubicSDR for mac os. We suggest downloading the latest version as there will be minor bug fixes, etc! This will download the latest build and extract it into the current folder. SDR# does not install into the toolbar or start menu! Before we continue, we'll have to install the Windows driver for the RTL USB stick and then swap it for a 'low level access' driver. 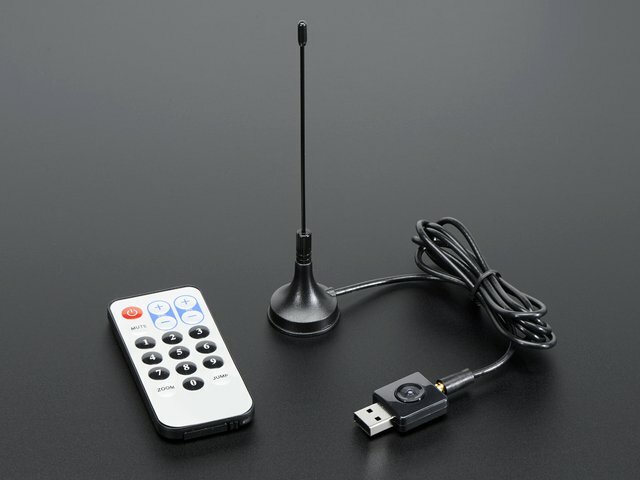 The default driver assumes you'll just be using the RTL-SDR for watching TV or radio but we want to be able to control it to do much more. Now from inside the SDR# directory, run Zadig which will do the driver swapping for us. Then from the devices drop-down, find one that says Bulk-In, Interface (interface 0). If there's more then one, select one at a time, and verify below to get the right one. Click Play/Start and set the volume starting from low to high so you don't hurt your ears! Chances are your radio station is also playing Donna Summer! Most every-day AM/FM radios can't tune into theNOAA Weather Radio (NWR) All Hazards network but with RTL-SDR we can! NWR is the national weather alert system, which broadcasts weather data as well as emergency alerts. Let's tune into the closest weather station to Adafruit Southern California, which is in Los Angeles. You'll want to tune into whatever station is closest to you. You should be able to hear a computer-generated voice speaking out the weather forcast. It's not terribly exciting but it is very thorough, often giving very detailed reports. The signal continuously transmits so you can tune in at any time! now that you have some basic functionality working, try tuning into other frequencies, and trying the different kind of decoding (e.g. CW/AM/NFM) to tune into AM radio! Once you've downloaded the installer (in this case named CubicSDR-0.2.3-Darwin.dmg), double-click it to mount the disk image, and then drag the CubicSDR.app to your Applications folder as shown here. Now, plug your RTL-SDR dongle into a USB port on your mac, and then double-click the CubicSDR.app in your Applications folder to run it. When you launch CubicSDR, it will pop up a window asking you to select and start your SDR device. Pick the one named Generic RTL2832U OEM :: 00000001 and then click Start. We'll begin by listening to some broadcast FM radio. First, make sure your RTL device has started by clicking the File > Stop / Device menu item. When it is running you will see the waterfall frequency display moving at the bottom of the interface, as well as some moving waveforms in the other areas. The CubicSDR software in combination with the RTL dongle can tune and demodulate different ranges and types of radio signals. For this example, we'll select Frequency Modulation Stereo (FMS) as the signal type. Next, you can tune in a station! Start by setting a center frequency for a station you like, by clicking on the numbers under the "Center Frequency" heading. This will bring a range of frequencies into view -- approximately 3MHz at a time are available. Now, you can set a demodulator down on a range you want to tune. This is done by clicking in the waterfall display, with the cursor at the center of the frequencies you want to hear. This will usually be the orange and red display section, showing you where the strongest signal lies. Here, the demodulator has been set at 91.499261MHz, and we have a nice strong signal. Music plays! You can see the fine tuning section in the upper left corner gives us a zoomed in view of the demodulator. You can drag this one left and right in the waterfall section to fine tune, or grab one of the outer edges of the demodulator to change the bandwidth that is being processed. Too wide and you'll pick up unwanted signals, too narrow and you'll start to cut off important parts of the signal. You can search for other stations by scrubbing the peaks display left or right and looking for strong peaks. Set down a demodulator in the waterfall area under a strong peak to listen in. The frequency band for FM broadcast radio is 88MHz to 108MHz. The frequency is 162.550 MHz, type that into the CubicSDR tuner window by hovering over the Center Frequency box and hitting spacebar. You can see a little peak, its much smaller signal than the FM radio stations. It's also much thinner which makes it a narrow-band FM rather than wideband. Since it's voice, not stereo music, they use less of the frequency band, so select NFM as the decoding type. Click to set a demodulator at the 162.550 MHz peak. You should be able to hear a computer-generated voice speaking out the weather forecast. It's not terribly exciting but it is very thorough, often giving very detailed reports. The signal continuously transmits so you can tune in at any time! The SDR dongle seems to get hot! You need a computer with at least one USB 2.0 or higher port. You will also need admin privs to install the software, we used it on Windows 7, XP should be the same. There's also software for Mac and Linux but we don't have tutorials for it. Google around for RTL-SDR and what you wanna do for lots of ideas! This guide was first published on May 19, 2014. It was last updated on May 19, 2014.